Drove over the Smokies from Gatlinburg to Cherokee, NC. Nothing on the TN side of the mountain looks anything like I remember it. Gatlinburg was always commercial, but nothing like Pigeon Forge is today. Wow. Unrecognizable. 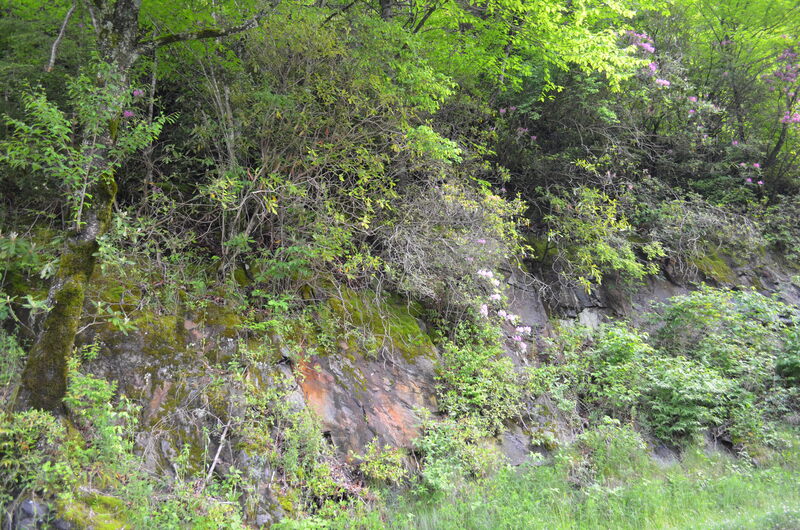 But once you cross the line from Gatlinburg to the National Park, it changes immediately and becomes peaceful. It’s really a good thing they made it a park, otherwise it would all be developed. Flowers blooming along the road, above. 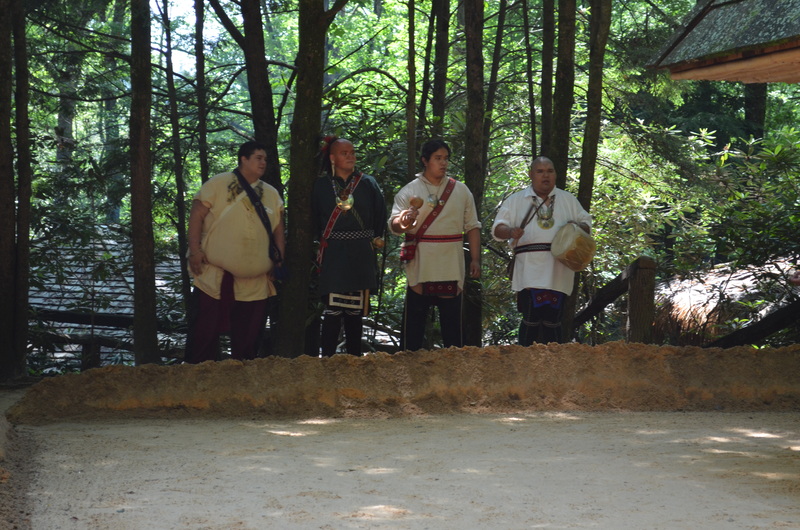 On the NC side, the park abuts the Cherokee Indian Reservation. You’d never know you were on a reservation if you didn’t know. It doesn’t resemble the western reservations whatsoever. This just looks like a normal Appalachian town, with a focus on Native culture, of course. I visited three locations, in addition to several stores. 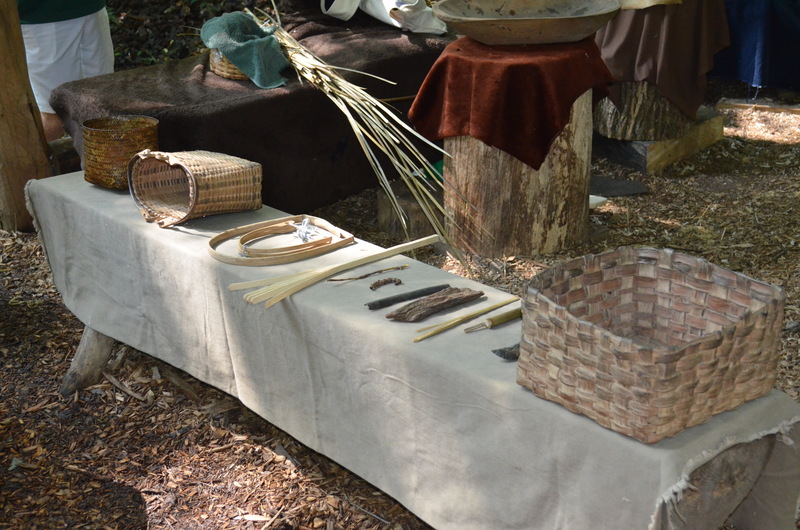 The first was the reconstructed Indian Village. This was simply pure joy. The people here were exceptionally friendly and were all Native people living on the reservation today. They were anxious to share about their culture and heritage. My hour visit quickly turned into more than half a day and includes lots of extras. They were very generous with their time. Here is the village link, but I’ll tell you, this does not even begin to do it justice. If you have to select just one thing to do in Cherokee, this is it! 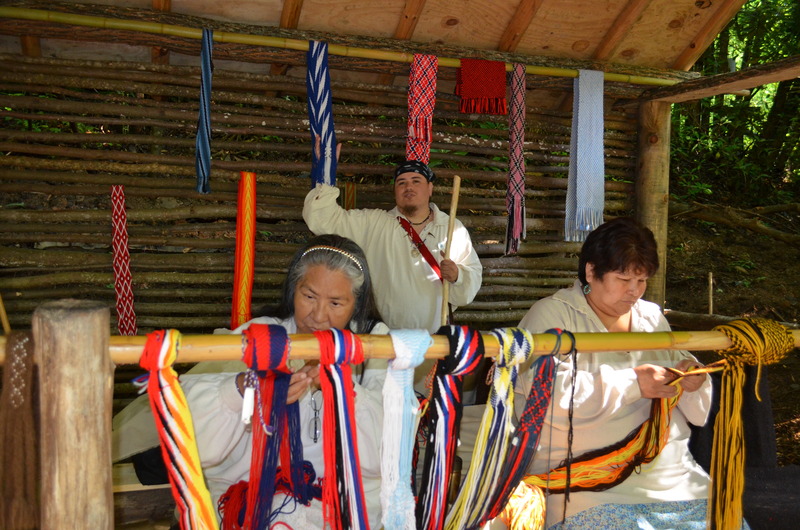 The village is a reconstructed historic village, to scale, which includes several houses where traditional crafts and activities are being practiced. In addition, there is a council house and a traditional town center where dancing occurs. I went to the village first hoping to avoid the heat that was sure to be present in the afternoon. 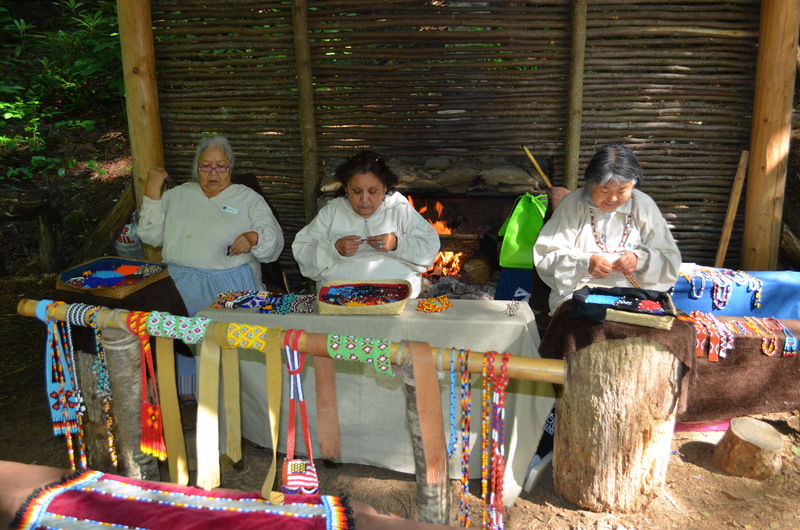 Tribal members there doing traditional things like beads, pottery, carving, basketmaking, etc. The next photos shows the undercoat of a buffalo having been woven with beads during the weaving. This was extremely soft. I never thought of a buffalo being soft, but these are. The mountain bison were smaller than western buffalo and became extinct in the 1790s. 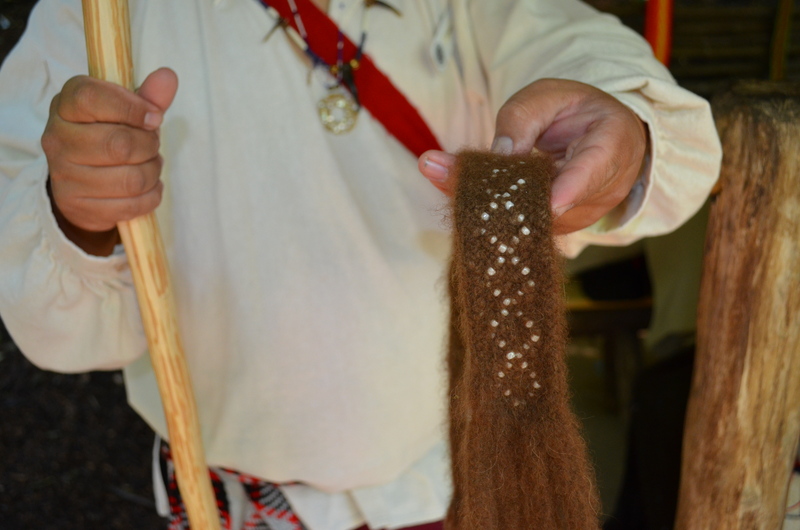 Today the beadworkers use contemporary beads like the rest of us, but traditionally the cornbead was used. It grows on a plant called the cornplant and it is hard when harvested. 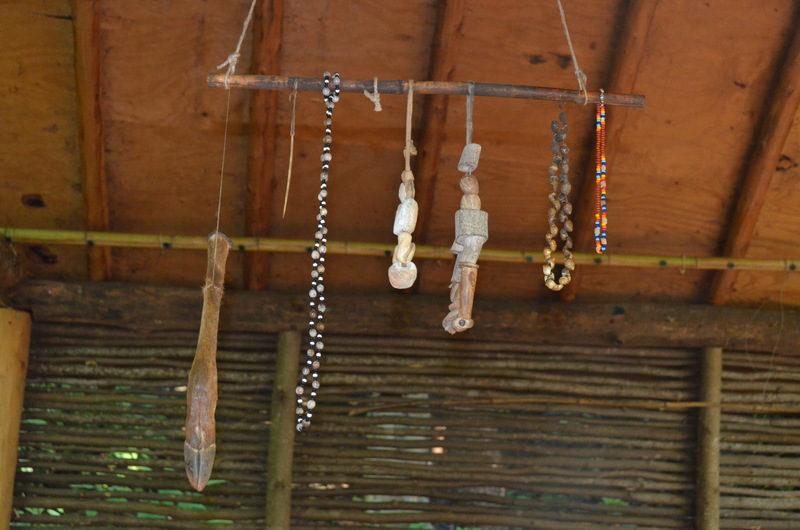 There are some traditional beaded items, before the advent of European beads. The cornbeads are the grey stand near the left. 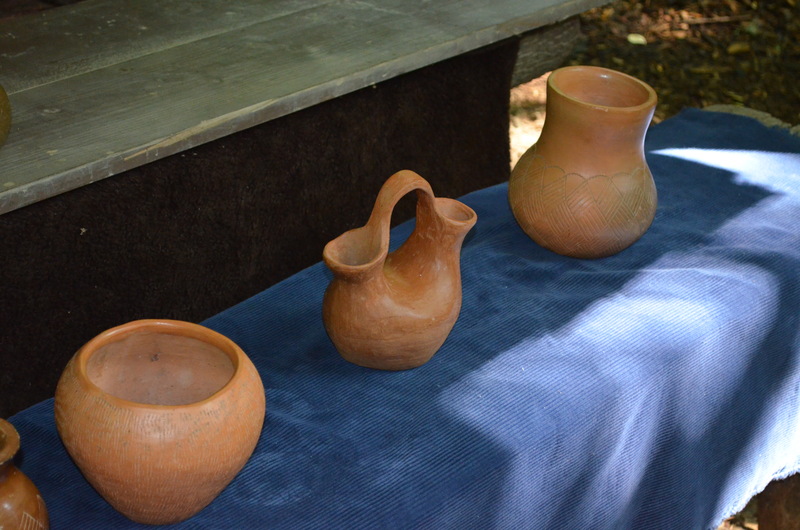 Pottery of course was a village staple of all Native people. Pots were used for everything from carrying water to cooking to being decorative and celebratory, like with the marriage vessel below. The bride and groom would each drink from opposite sides, then the pot would be broken. The carvers were quite interesting. Everyone here knew a great deal about their history and heritage. 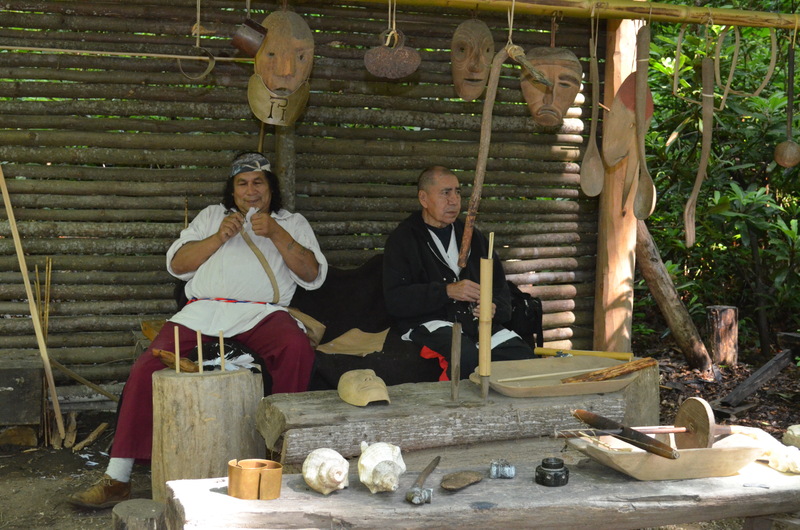 These men carve wood, bone and even feather shanks. Notice the beautiful masks, below, one with a copper gorget. The shells shown below are not carved. They are crushed and used in the whitewash for their body paints. On the coast, they aren’t used this way. The difference in both use and culture was very interesting. 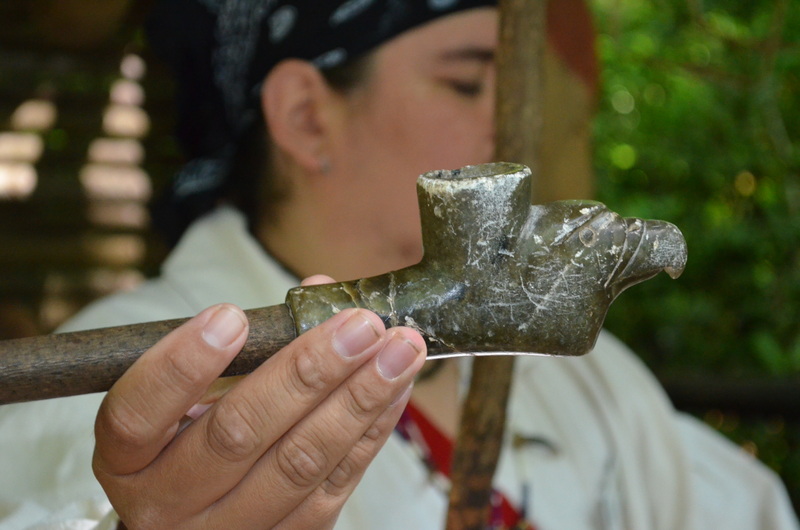 The pipe below is carved in the shape of an eagle. The prepwork involved in basket-making and weaving is unfathomable. By the time they begin the basket itself, much of the work is done. Some baskets are actually watertight. If I ever thought I wanted to do basketwork, this cured me and instilled a great respect for those who do. The flintknappers were very interesting. Of course, most of the food supply was dependent on arrowheads. Some were squared off and some were round. The ones meant for food were rounded at the shank so they could be pulled out. The squared ones were meant for enemies and removing by pulling them out wasn’t possible. 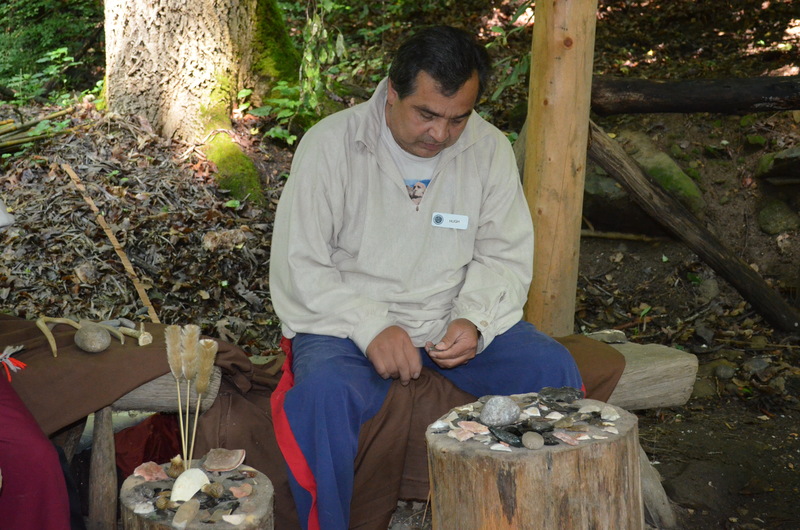 The man below is knapping flint by knocking off the edges to achieve a sharp blade type edge. 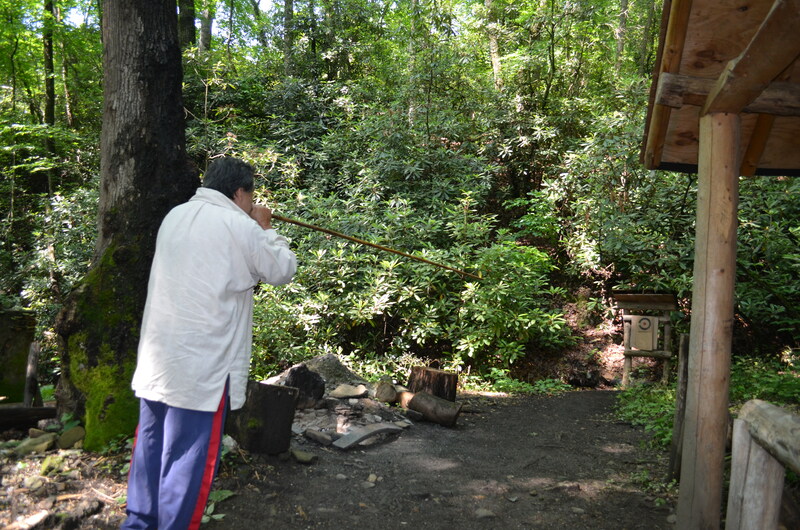 This man also demonstrated the use of a blowgun. Poisons weren’t used, because the animal was to be used for food. He was quite accurate. Above the village on the mountainside is a botanical gardens. This was a lovely half hour hike. You cross several streams and they also have a homestead with a Native garden. 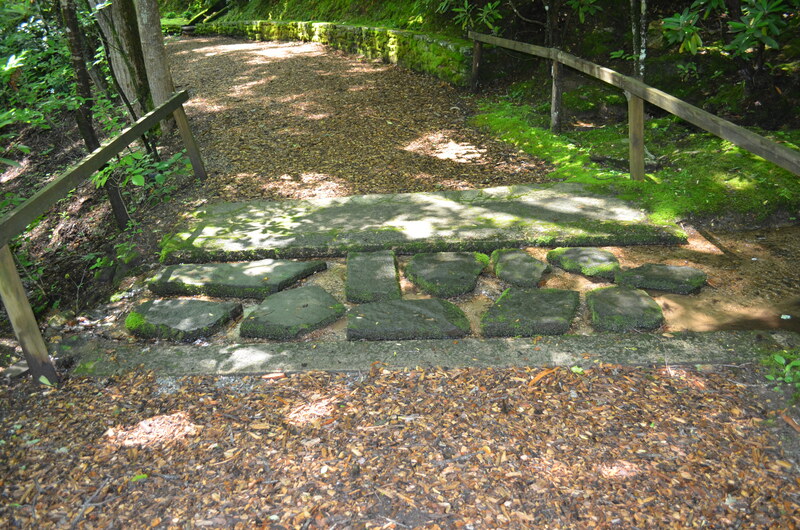 The stream crossing below is not a bridge, but a walk across the stream itself. Very unique. In spite of the heat, there was lots of moss growing in the cooler forests. 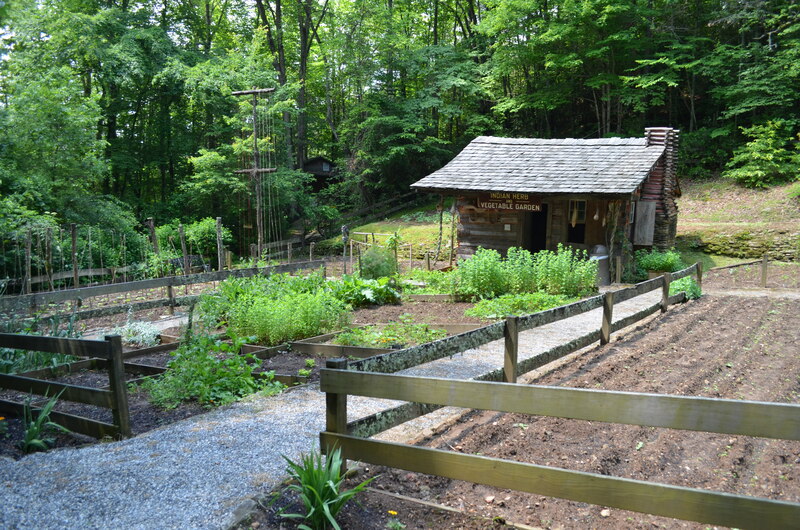 In a clearing, but really almost undetectable, was a small dwelling surrounded by Native food and medicinal plants. 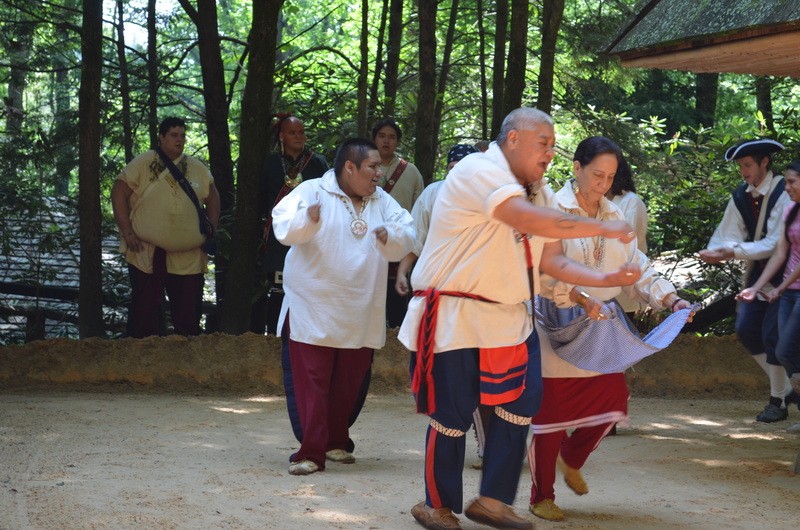 As I was descending, the dancing and drumming was beginning, and listening to the vocables alone in the forest was a very spiritual experience. It was easy to reach back in time to how it would have been long ago. The dances they performed are not powwow type of dances, which is what I expected and am familiar with. These are called traditional dances. They emulate natural things. One is the corn dance which is about gathering corn, one is the bear dance and one is about a confused fowl of some sort, but quite funny as he struts around trying to impress the females of his species. These were obviously for fun, and except for the heat, the performers were having fun dancing. I found the traditional dancing very interesting. It’s not the same as powwow dancing, not at all. What fun. Took lots of photos. When the dancing started, I was up on the mountain in the botanical gardens and hearing the dancing, alone in the woods was quite moving. Harkened back to another time and place. I do love the vocables. Because you don’t understand the “words” you respond to the very beat of the earth. After the dancing, they offered a lecture from one of the Beloved Women in the Council house and that was very interesting. She is shown above dancing with the purple apron. She explained how the council house was divided into 7 sections for the 7 clans, and how their tribal government worked. She told me afterwards that when the Cherokee took refuge in the mountains, pre-contact, they were known to the other tribes as the “white Indians” because their skin was lighter, their hair curly and they were taller. Interesting. In the photo of the inside of the Council House below, the mound in the lower center which is about 3 feet high is the eternal fire. Each year the women extinguish their fireplace fires and clean out the fireplace and them come to the Council House and get a new fire. The fire in the Council House is never allowed to go out but the ashes are removed once a year as part of the renewal ceremonies. The Eastern Cherokee tribe’s current blood quantum requirement is 1/16th. Many have been quantumed out. I spent quite a bit of time there visiting. From there I went to the museum, which was OK, but not remarkable, especially not after the village. 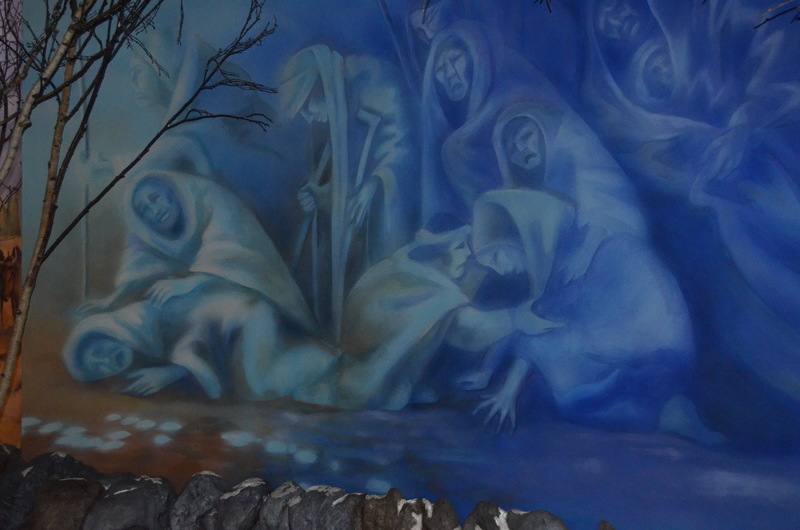 The thing I found moving in the museum was a lifesize mural of the Trail of Tears. The museum in Talequah in Oklahoma has something similar as well. 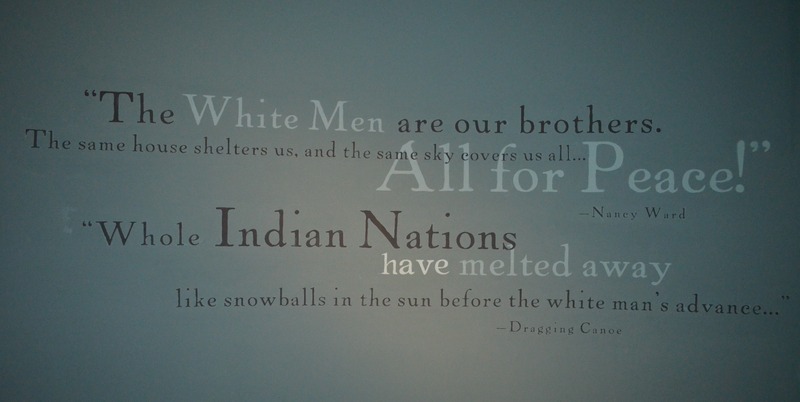 The individual and tribal pain of this genocidal action, not only for the Cherokee, but all of the organized tribes that were removed were almost unfathomable, especially after they trusted the whites. Would the betrayal ever stop? From the Museum, I went across the street to the handcraft store. I had purchased a beautiful small carved bone eagle from the carvers in the village, so I passed on items in the store, but they were certainly beautiful. Not all are Cherokee though. I visited a few more stores, a bookstore, Talking Leaves, which was nice, a Cherokee coffee shop and a rock store off the res along the road. I passed on the casino, although I understand the shops in the casino hotel are nice too. I was glad that I spent most of my time in the village with the people and the handcrafts. It was a lovely day and I’d certainly stop to visit again. The people were most gracious and sharing. 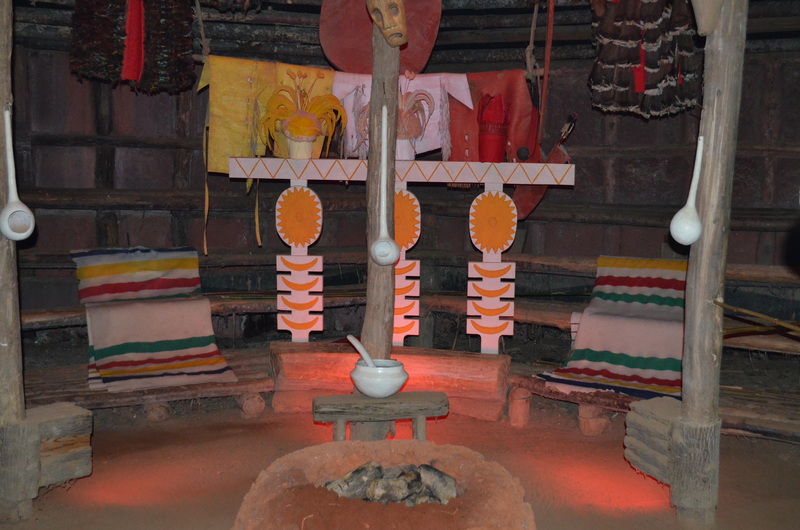 The photo below is from the museum and serves to represent two different perspectives within the historical Native community. This was most enteresting. Thanks for sharing all the great pictures! Im over due for another visit to Cherokee NC. & the “Lumbee” in Pembroke NC? The town of Cherokee, NC is on the reservation. They have a visitor center there. Call them and talk about what you want to do and what they have to offer. I strongly recommend visiting the village above the museum. They will know exactly what I’m referencing. That is where the photos I took are from. This is the only reservation in that area, so it has to be one and the same. I wish i could live there with the indians! Thanks so much for posting this piece. It’s well-written, sensitive, informational and full of great photos. I was researching the subject and was very glad to have found it. Do you happen to know how I can contact the handcraft store you mentioned in the article? My husbands great grandmother was Cherokee from NC., He has no roll number. I don’t. I would just google. We visited The Museum of the Cherokee Indian and the Qualla Arts and Crafts during our road trip to the Great Smoky Mountains last year. It was a great experience. I only wish we had more time to experience some of the other cultural attractions in Cherokee.